Twenty years ago, Mercedes-Benz presented the latest CL of the C 215 model series at the Geneva Motor Show, a predecessor of today’s S-Class coupé. As a world’s first, the luxury class coupé offers, amongst other things, the Active Body Control (ABC) active chassis system, a Mercedes-Benz development for active safety. By 2006, 47,984 of these coupé vehicles had been built. A driving feeling as if you are floating: that’s how the new Mercedes-Benz CL of the C 215 model series inspired 20 years ago. For in the luxury class coupé, the Active Body Control (ABC) chassis system developed by Mercedes-Benz celebrated its world premiere. It is amongst the most important innovations for active safety by the Stuttgart brand. ABC minimises pitching and rolling of the body, increases safety reserves and bolsters the freedom from fatigue of the driver. The system was developed in the 1990s in the company’s research department and, thanks to its high level of effectiveness, was directly implemented into a series vehicle. The CL was introduced 20 years ago at the Geneva Motor Show from 12 to 21 March 1999. Sales began in August 1999, with the press trial drive taking place from 27 September to 8 October 1999 in the south of France. 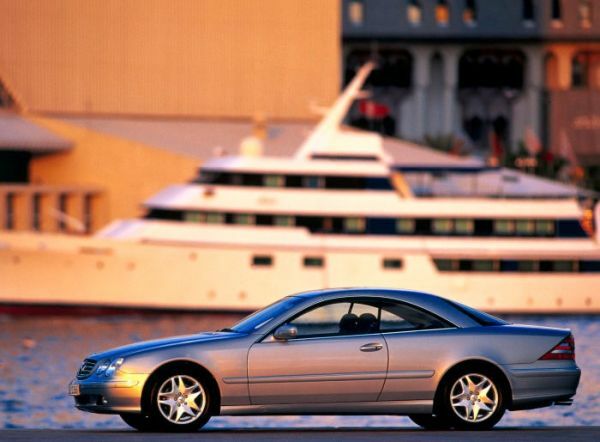 The CL 500 with a V8 engine and 225 kW (306 hp) was first to arrive in dealerships in October 1999. The 270 kW (367 hp) CL 600 with a new V12 engine followed in 2000. “The special fascination of the CL 600 lies in its uniquely effortless drive” – so wrote specialist magazine “Auto, Motor und Sport” about the top model in the 23rd edition of 1999. The newly developed V12 engine of the CL 600 is equipped with automatic cylinder deactivation. Together with other measures, it reduces fuel consumption compared to the predecessor model of the C 140 model series by around 20 per cent. Cylinder deactivation is also optionally available for the CL 500. 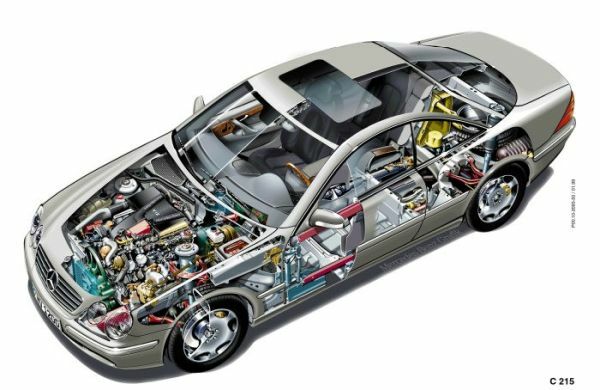 In addition to the CL 500 and CL 600, there are also two AMG high-performance versions of the C 215 model series: the V8 model CL 55 AMG (265 kW/360 hp) was presented in the late autumn of 1999, and the twelve-cylinder version CL 63 AMG (324 kW/444 hp) came onto the market in 2001. The new CL looks to the world with many headlamps as its extended silhouette and the arched roof line emphasise the dynamism of the coupé. In this case, the designers managed quite a feat: on the one hand, the body of the C 215 is 72 millimetres shorter, 55 millimetres narrower and 54 millimetres lower than the predecessor C 140, and the wheelbase is also reduced by 60 millimetres. The equipment of the luxury class coupé corresponds to its position at the top of the Mercedes-Benz model programme, which is built at the Sindelfingen plant on its own line. The instrument panel, seats and door and side panels as well as the armrest of the centre console are upholstered in leather as standard features. Wood sets further accents. And, from the spring of 2001, there were even designo stone trim parts available for the vehicle interior of the CL. They are made from natural Labrador blue pearl granite. In a patent-protected process, they are cut into 0.6 to 0.8 millimetre sheets, which are shaped and applied to the centre console, door panelling, steering wheel rim and gearshift lever. Mercedes-Benz realises this exclusive equipment in a series production vehicle for the first time. The technical equipment of the CL is also on a high level. Alongside the Active Body Control (ABC) system, the luxury class coupé features ESP® (electronic stability programme), ASR (acceleration skid control), ABS (anti-lock brakes) and BAS (brake assist) as standard features. Add to this the all-new bi-xenon headlamps with a cleaning system for the main-beam and low-beam headlamps and the PARKTRONIC system. Numerous airbags protect the passengers, and integral seats for the driver and front passenger with easy-entry function and a new multi-joint door hinge for easy climbing in and out contribute to comfort. An electronic tyre pressure monitoring system, the DISTRONIC autonomous intelligent cruise control and further solutions such as the chip card-based KEYLESS-GO drive authorization system are available upon request. The C 215 even pursues a career on the race track. In the 2000 Formula 1 season, a modified Mercedes-Benz CL 55 AMG is used as the Official F1™ Safety Car. From autumn 2000, Mercedes-Benz offered the CL 55 AMG “F1 Limited Edition” in Safety Car style for sporting customers. The coupé was limited to 55 units and had highly exclusive equipment. It was the world’s first road-legal vehicle to decelerate by means of a brake system with internally ventilated brake discs made from fibre-reinforced ceramics. The press release on the Mika Häkkinen special model, the racer that won the Formula 1 World Championship in a McLaren-Mercedes in 1998 and 1999, comments on this aspect: “The most important part of a sports car is not the engine, but the brakes.” The vehicle interior offers, amongst other things, sports seats with optimised lateral stability, an AMG sports steering wheel, wheel trim made from carbon fibre and “F1 Limited Edition” lettering with sequential numbering on the centre console. Mercedes-Benz premiered the CL 63 AMG with 326 kW (444 hp) at the International Motor Show in Frankfurt am Main (IAA) from 13 to 23 September 2001. Its V12 engine with 6,258 cubic centimetres of displacement has a maximum torque of 620 newton metres and allows acceleration at sports car levels, just as it does superior travelling. The 63-digit sequence in the model designation of the CL top model is reminiscent of the legendary Mercedes-Benz 300 SEL 6.3 (W 109). 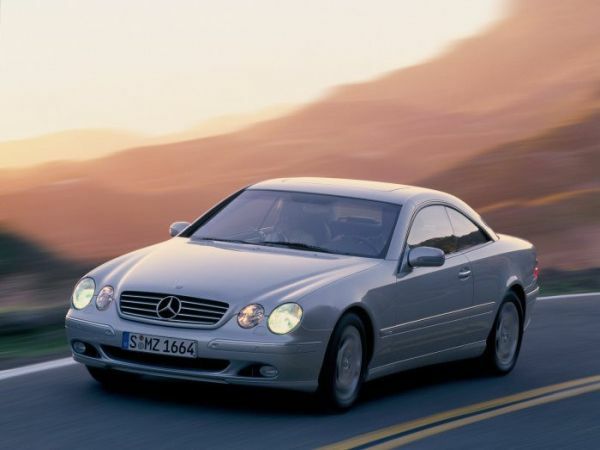 In September 2002, Mercedes-Benz unveiled the new generation of the C 215 model series. On the outside, the facelifted coupé stands out thanks to its headlamps in a clear glass style, reworked bumpers and new exterior mirror casing – now with surround lighting. Technically, the CL 600’s new V12 engine, with 5,513 cubic centimetres of displacement and bi-turbo set-up, is a sensation. It generates 368 kW (500 hp), that’s 36 per cent more than in the CL 600 (5,786 cubic centimetres of displacement, 270 kW/367 hp) built from 2000 to 2002. The performance of the CL 600 is also achieved by the CL 55 AMG, which was offered from autumn 2002. However, its AMG V8 engine has more sporty characteristics than the V12 drivetrain. The C 215 model series is rounded up in 2003 by the new CL 65 AMG with 450 kW (612 hp) output from 5,980 cubic centimetres of displacement. Back then, the high-performance coupé – along with the S 65 AMG saloon presented at the same time – was one of the most powerful cars in the history of AMG and Mercedes-AMG GmbH, founded in 1999. The CL 65 AMG accelerates to 100 km/h from a standing start in just 4.4 seconds; its V12 engine with bi-turbo set-up has up to 1,000 newton metres of torque (electronically limited). The top model is equipped with an AMG SPEEDSHIFT five-speed automatic transmission with steering wheel gearshift as well as with Active Body Control (ABC) with AMG-specific suspension struts and more firmly tuned dampers.